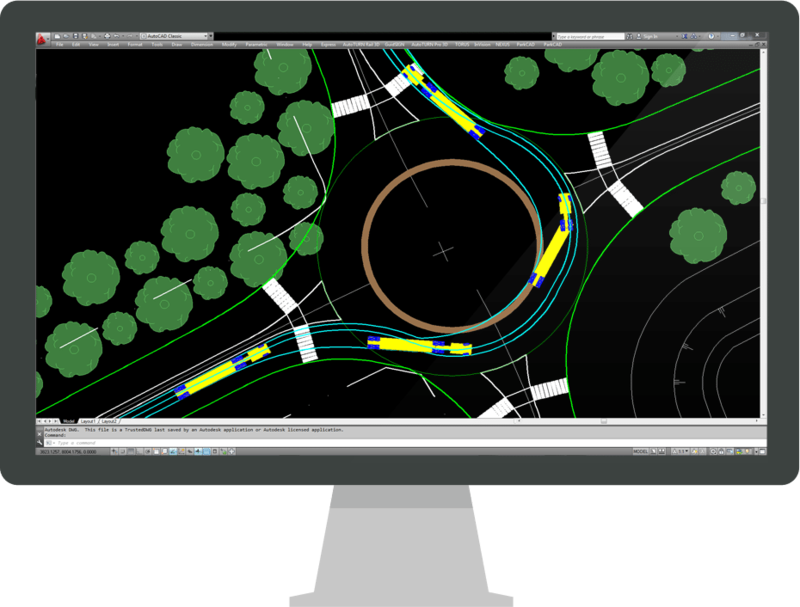 TORUS® gives you the right tools to design roundabouts smarter and more efficiently. It generates initial geometry honoring reference criteria, and provides real-time feedback regarding recommended dimensional and analytical ranges. Make edits to your design parameters and get instant feedback during the process. TORUS now supports the Stockdale Method, which allows grading the central regions starting from the exterior (Inscribed Circle Diameter) to the central island. Compatibility with Autodesk® AutoCAD® / Civil 3D® 2018 and Bentley® MicroStation® CONNECT®. Focus on engineering designs by eliminating taxing manual calculations, repetitions, and iterations. Manage critical guidelines through active conformity notifications. Be more productive with drafting designs using parametric drafting and dynamic design modeling. Make informed design decisions with real-time safety and performance analysis feedback like fastest path analysis and sight line checking. 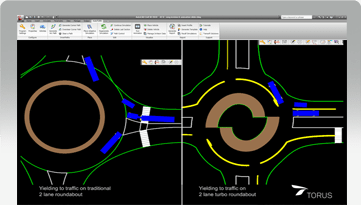 Overview What's New in TORUS Roundabouts The new TORUS Roundabouts 5.1 release from Transoft Solutions takes the evolution of this software to another level with new features for designing turbo roundabouts and checking vehicle paths and fastest paths on circular or non-circular roundabouts. This new version represents the most sophisticated roundabout design software available in the industry. Designing roundabouts that meet traffic operations, site constraints and safety performance measures has never been easier. 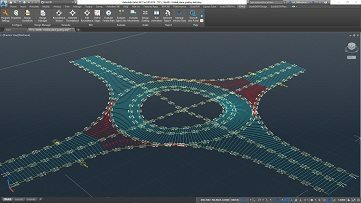 The new TORUS Roundabouts release takes the evolution of this software to another level with new features for designing turbo roundabouts and checking vehicle paths and fastest paths on circular or non-circular roundabouts. https://www.transoftsolutions.com/wp-content/uploads/2017/09/Grading-of-the-Central-Region.jpg Overview 3D ROUNDABOUT SURFACE GRADING Use TORUS to carry out your roundabout’s grading design. Have full control to design crown profiles and cross slopes in 3D to ensure approaches connect with your roundabout. Free-form grade the central island regions to design tilted plane or even folded plane. Users can grade the central regions either from the exterior (Inscribed Circle Diameter) to the interior (Central Island) or from the interior to the exterior. Free-form grade the central island regions to design tilted plane or even folded plane. Users can grade the central regions either from the exterior (Inscribed Circle Diameter) to the interior (Central Island) or from the interior to the exterior. Overview TURBO ROUNDABOUT DESIGNING Generate Turbo Roundabouts as easily and quickly as conventional designs. Turbo roundabouts use mountable curbs and spiraling geometry to reduce merging accidents. Utilizing the patented Vehicle Envelope Method, TORUS Turbo Roundabout’s key geometric elements such as circulatory lane widths and entry and exit widths are dictated by the design vehicle swept path envelope. Generate Turbo Roundabouts as easily and quickly as conventional designs. Turbo roundabouts use mountable curbs and spiraling geometry to reduce merging accidents.